The Muppets is exactly what I hoped it would be: the best Muppet movie since The Muppet Christmas Carol (1992). It’s a gift to decades’ worth of fans who love these characters. A true return to form, The Muppets taps into those unique brands of humor and magic that made The Muppet Show (1976-1981) so popular. I only ever saw the show in syndication, but once I discovered it, I couldn’t stop watching. While anyone can enjoy this movie, it was made by fans with fans in mind. It’s important to note before continuing that I don’t know how to write this review objectively, because you see, The Muppets was made for me, and if you love these characters, it was made for you, too. Gary (Jason Segel) and his brother Walter (played by a Muppet) are lifelong fans of The Muppet Show. 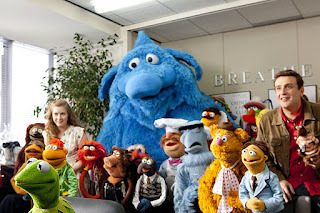 When Gary and his girlfriend Mary (Amy Adams) plan a trip to Los Angeles, Walter comes along to fulfill his dream of visiting the Muppet Studios. Upon arrival, the trio is shocked to find the Muppet Theater in disrepair. Oil tycoon Tex Richman (Chris Cooper) plans to destroy the Muppet Theater and drill for oil. Gary, Mary and Walter set out to round up the Muppets (many of whom, we learn, haven’t spoken to each other in years) to put on a Muppet Show fundraiser, though they struggle with the fact that no one seems to care about the Muppets anymore. Muppet veterans Brian Henson and Frank Oz weren’t involved in this production, so a few character voices sound slightly different, but the overall tradition of excellence continues. Muppets and humans blend seamlessly into the same scenes, though a phenomenal amount of work goes into making that look easy. The best thing that can be said for the puppetry is that it goes unnoticed; all we see are characters on screen. Muppet performers have pulled this off for years, though it continues to impress. The human actors are stellar. Jason Segel (who co-wrote the movie) plays Gary with sincerity, and he sings and dances with apparent ease. Amy Adams has excelled at musical comedy before, and she nails it again this time. Chris Cooper plays the villain totally straight, which was the right choice. The best actors in Muppet movies are the ones who play the material with as much seriousness as possible, as the Muppets themselves provide the laughs. Why does Cooper’s Tex Richman hate the Muppets? The Muppets exist to make people laugh (laughter is identified as “the third best gift of all time,” after children and ice cream), and Richman is physically incapable of laughter. Also in keeping with Muppet tradition is the long list of memorable celebrity cameos. Newcomers to the Muppets will enjoy this movie, but for fans, there’s an enormous nostalgia factor at work. Watching the opening number of The Muppet Show (“It’s time to play the music, it’s time to light the lights”), exploring the Muppet Theater, and even just seeing the characters on screen again was heartwarming. Kermit, Miss Piggy, Gonzo, Fozzy - I’m glad to have them all back. Gary, Mary and Walter are all Muppet fans, which helps us connect with them immediately, and making Walter a Muppet was an inspired choice. There’s plenty for kids to enjoy in the way of energy and spectacle, but as usual, adults will get the most out of the story and the jokes. There’s plenty in this picture for everyone, which makes The Muppets a family film in the best sense. I think Jim would be proud. MPAA: Rated PG for some mild rude humor. The only mild rude humor I can recall comes when Fozzie Bear straps whoopee cushions to his feet and dubs them “fart shoes.” There are also a few moments of cartoony violence (puppets getting electrocuted, getting into fights, etc. ), but on the whole, there’s very little in the way of potentially offensive material. I honestly can’t imagine why any child wouldn’t enjoy this movie.